Despite the superabundance of data companies already disclose, institutional investors are looking for more. Responding to both investor demand and Securities and Exchange Commission mandates, the 10-Ks, 10-Qs, and proxy statements issued by companies contain more nonfinancial information than ever before. In its latest 10-K, for example, Alphabet devotes close to 700 words to supply chain risks. Apple’s 2016 10-K takes 500 words to describe data breach dangers. Caterpillar’s annual filing includes 2,200 words on potential operational perils. The Dodd–Frank Wall Street Reform and Consumer Protection Act has added to the reporting deluge, controversially requiring information like the ratio of CEO pay to that of the median rank-and-file worker and whether a company uses so-called conflict minerals from war-torn African countries in its supply chain. The growth of information supplied by companies hasn’t, however, deterred investors’ calls for additional data from publicly traded U.S. firms. Information on cybersecurity practices, audit committees and auditor relationships, board expertise and diversity, and compensation plans and other workforce metrics are all under discussion. The extent to which stakeholders are looking for more intelligence became apparent in April 2016. That’s when the SEC released a concept paper discussing possible revisions to Regulation S-K, which contains provisions mandating much of the nonfinancial disclosure by registrants. The initial 1977 version of the regulation included only two disclosure requirements — a description of business and a description of properties. The concept paper, mandated under 2012’s Jumpstart Our Business Startups (JOBS) Act, solicits opinion on the effectiveness of the current burgeoning disclosure regime and at the same time opens the door for its further augmentation. Investors claim their demands are reasonable, and they would like to see some rulemaking eventually arise from the concept paper. But finance chiefs and regulators are skeptical; many think the kind of information discussed would not be germane to an investing decision. In their own comment letters, finance professionals expressed doubt about the utility of some of the nonfinancial information. The response of some large investors to additional disclosures, on the other hand, is “bring it on.” They caution against attempts to curtail disclosure or limit its growth, and they have little worry about information overload. Non-GAAP reporting. Bertsch would also put external auditors on the line by making them responsible for reviewing and signing off on all non-GAAP portrayals of company financial performance. “Although the use of non-GAAP financial measures to describe financial performance can be appropriate and useful to investors, it can also obscure a company’s financial performance and mislead investors,” Bertsch argues. “Non-GAAP has been abused, at least until the SEC put out guidance last May.” Berstch said upcoming quarterly reports and proxy statements will demonstrate the extent to which this problem continues. 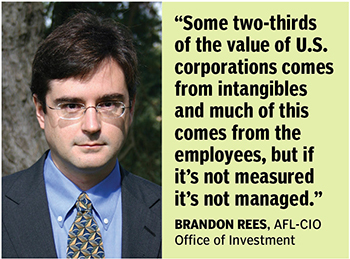 Brandon Rees, deputy director of the AFL-CIO’s Office of Investment, represents a key stakeholder group calling for more human capital disclosure. “Most companies would say their employees are their most valuable assets, but many companies have said they just don’t know what the median pay of their employees is,” he says. “Some two-thirds of the value of U.S. corporations comes from intangibles, and much of this comes from the employees, but if it’s not measured it’s not managed,“ argues Rees. He calls for (among other things) a narrative “of how other employees are paid when setting CEO pay targets” and a narrative to “explain why the (CEO) pay ratio is what it is.” He also would like to see disclosure of employee safety and health information, race and gender workforce composition, and employee turnover and retention rates. Is adding to the bulk of information that a publicly held company has to report really progress, and would it really help investors? 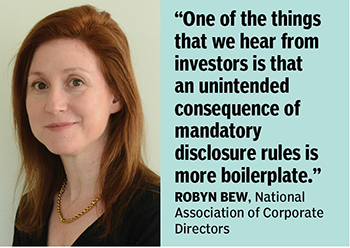 Robyn Bew, director of strategic content development at the National Association of Corporate Directors, contends that promulgating more disclosure mandates may, in fact, obscure the more important stuff. “One of the things that we hear from investors is that an unintended consequence of mandatory disclosure rules is more boilerplate,” she says. “It would be more useful if companies and boards could do more of their own thinking. That being said, there are examples of disclosures that corporate directors, pushed by investors, would like to see more of. Bew notes that directors are also aware that investors are increasingly demanding more disclosure about boards themselves. “Why is this group of directors the right group in terms of skills and diversity?” is a question companies face pressure to answer. “Voluntary disclosures of this kind have really exploded as part of this sea change,” Bew says. Directors also feel more obligated to describe the functioning of audit committees. Even before possible promulgation of rules mandating these kinds of disclosures, many companies are already disclosing how “audit committees make decisions and how they oversee the external auditor,” says Bew. Much of this is (or should be) investor driven. Boards need to ask themselves whether “they are getting feedback from investors,” and make sure that they are getting this feedback in adequate amounts. “Many companies must already be doing this, because what we’ve seen is that interaction between boards and investors is on the rise,” Bew says. The change in presidential administrations and the Republicans’ control of Congress may stem the tide of increased transparency, though, and give companies a breather on new disclosure mandates. The new powers that be appear averse to the imposition of any kind of additional regulatory burden. In February, for example, acting SEC chair Michael Piwowar asked issuers to submit information about any unexpected challenges they face complying with the CEO pay ratio rule. He also asked the SEC staff to reconsider the implementation of the rule and possibly provide relief based on those comments. Then, in early April, the SEC suspended enforcement of part of the conflict minerals rule. As a result, issuers are not required at present to conduct a due diligence review or an audit of the source of conflict minerals in their supply chains. While the fate of those rules is uncertain as the Senate considers Trump’s appointee to be SEC chair, Wall Street attorney Jay Clayton, there is also speculation about the potential rollback of parts of Dodd-Frank. Provisions mandated by the Act that require disclosure of CEO pay versus performance have already gone into effect. And an earlier-implemented Dodd-Frank rule requires companies to conduct nonbinding shareholder votes on executive pay, the so-called “say on pay” provision. Fortunately for CFOs who would rather see disclosures streamlined, the SEC does have a counterbalance to investor demands: the Disclosure Effectiveness Initiative, a project started by former SEC Chair White. The initiative is designed to examine whether existing disclosure requirements should be modified or eliminated and whether new disclosure requirements are necessary. While Sen. Elizabeth Warren (D–Mass.) has argued that the initiative is designed to protect investors from a nonexistent problem, “information overload,” the initiative may ultimately result in valuable reforms, like revising the Compensation Discussion and Analysis section to make it less dense and jargon-filled. 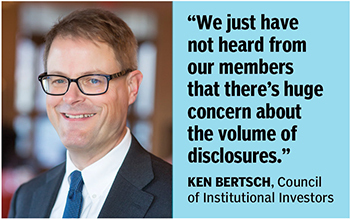 Whatever the timing and the extent of future disclosure requirements, there is already a sense that an increase in the volume of nonfinancial disclosures is inevitable. Many issuers are doing it voluntarily, not waiting for recommendations or rules from the SEC. 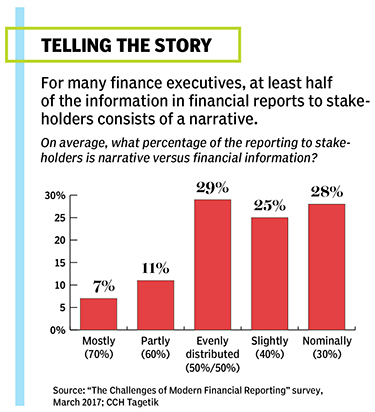 According to a survey of finance executives and professionals from more than 200 companies worldwide by CCH Tagetik, a software vendor, about half (47%) of respondents say their company reporting already consists of at least half “narrative” or “nonfinancial” information. Responsibility for complying with any new disclosure rulemaking, says Dave Kasabian, marketing director of CCH Tagetik, part of Wolters Kluwer Tax & Accounting, will fall mainly on the CFO. Kasabian is quick to point out that his company’s survey, released in March 2016, notes that most finance executives already dedicate a week out of each year to producing company reports. 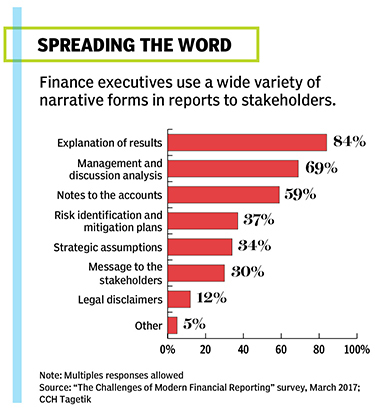 To get a handle on increased disclosure requirements without significantly extending this report-writing effort requires that CFOs “manage the process and put their own controls around it,” he says. What will the CFO get in return for all this effort? “If CFOs can bring together this array of material, by constructing the narrative they have the opportunity to be the strategic voice of the company,” Kasabian says. Ed Zwirn is a freelance writer in Bethel, New York.